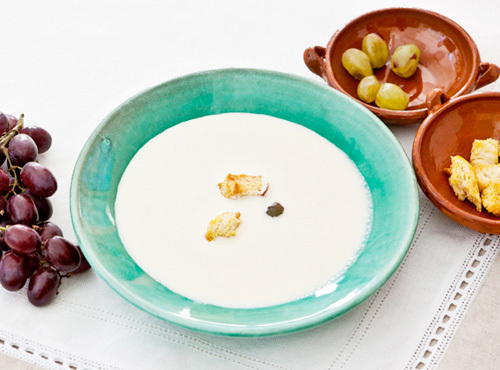 The very best Spanish sherry vinegar is the only product that will add the necessary zing to this white gazpacho. It is worth stripping the peel from the grapes for this lovely dish. Soak bread in milk for 1 hour. In a food processor, work almonds, garlic and salt to a paste. Add milk-soaked bread and blend well. With the motor running slowly, add oil, stopping to scrape bottom of bowl 2–3 times. The consistency should be that of thick mayonnaise. Remove to a bowl and slowly whisk in vinegar and water. Check for seasoning. Refrigerate for several hours. Fry cubed bread in oil and drain well. Whisk soup again, ladle it into flattish bowls and drop a handful of grapes into each bowl. Garnish with croutons.